Prevention and Control Category: KISC Target Species. OISC Target Species. MISC Target Species. Miconia is a fast growing weedy tree that reaches 13-50′ in height. It has large leaves that average 3′ long and 1′ wide, and are dark green and felty above, with a distinctive “leaf within a leaf” vein pattern. 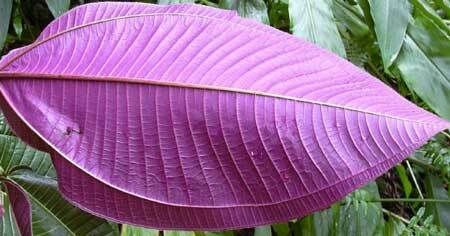 The underside of the leaves are purple. It produces dark purple fruits that are 1/3″ in diameter and contain hundreds of seeds. Miconia trees grow quickly and close together, shading out nearly all other forest plants with their large oval leaves. It also has a shallow root system and can cause increased erosion and landslides. Miconia quickly matures, producing fruit after three to four years and flowers and fruits several times a year. Plants produce ten to twenty million seeds a year, which can remain viable for twelve years and possibly longer. Birds and animals (such as rats) spread miconia seed long distances. Seeds, about the size of a sand grain, are unintentionally spread by humans and hitchhike on clothes, boots, gear, pets, and contaminated vehicles, equipment, and soil. Kauaʻi: There are three known populations, in Wailua River State Park, Wai lua Homesteads, and the Wailua Game Management Area. Oʻahu: Originally introduced and traded amongst botanical gardens in the early 1960’s, miconia has since spread into several locations in the Koolau range. The potential population boundary extends to 9,500 acres (including areas considered “seed banks”). Molokaʻi: No known to be present. Maui: Introduced to Maui in the early 1970s at a private nursery and botanical gardens near Hana. Infestations now occur in the forests near Hana, Nāhiku, Keʻanae and Huelo. Today, approximately 37,000 acres throughout East Maui, could potentially contain miconia. Not known from West Maui. Lanaʻi: Not known to be present. Kahoʻolawe: Not known to be present. Big Island: Large infestations on the windward side, with a smaller population on the leeward side. BIISC works to control populations on the windward side; community groups and private landowners also assist in some locations. If you see this species call 643-PEST, visit www.reportapest.org , and/or call your local ISC. Decontamination is extremely important to reduce the risk of spreading miconia. Hikers, biker and any vehicle or construction equipment can easily transport miconia’s long-lived, tiny seeds that are caught in tread, dirt, clothing, and mud.